Keyes Toyota: What’s New on the 2018 Toyota Sienna? What’s New on the 2018 Toyota Sienna? If you’re looking for a practical family hauler that’s stylish and well-equipped, you may want to take a look at the 2018 Toyota Sienna. 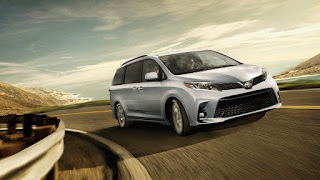 While the Toyota Sienna hasn’t been fully redesigned since 2010, the automaker we represent has updated this perennially popular minivan every year to keep it fresh and modern. For the 2018 model-year, the Toyota brand made some significant updates to the minivan. The biggest update was making the Toyota Safety Sense™ suite of advanced safety and driver assistive features standard on every trim instead of making it optional on the minivan’s mid-level and upper trims. This suite of features includes a forward collision warning that has pedestrian detection and automatic emergency braking, a lane departure warning, lane keeping assist, automatic headlights, and adaptive cruise control. The 2018 Toyota Sienna has a new look thanks to some new front-end styling as well. The minivan now has more USB ports for passengers riding in the rear rows and it boasts updated Entune™ infotainment system software, too. When you visit our Toyota dealership near Los Angeles, CA, you’ll see that the new Toyota Sienna is available in five primary trims. These trims include the L, LE, SE, XLE, and Limited. Every trim is powered by a 3.5-liter, six-cylinder engine that produces 296 horsepower and 263 lb-ft of torque. The minivan’s engine is matched with an eight-speed automatic transmission. If you’re ready to be the owner or lessee of a 2018 Toyota Sienna, we applaud you on your choice of vehicle! We also encourage you to submit an application for financing to our Van Nuys, CA Toyota finance center. Once we receive your application, we’ll reach out to you for any additional information we might need. To learn more about the 2018 Toyota Sienna or to take one for a test drive, visit Keyes Toyota today. Thanks for the post, Get to know about new Toyota Sienna. Looking for car body repair or service visit Greensboro Body shop to get the best car service at affordable price. Thanks for the information. For any kind of car key related issue if it is stolen or anything just visit toyota key to get yourself a spare key for your car at affordable price.